SteelHead CX/GX delivers best in class optimization for today’s Hybrid WANs, accelerating the performance of all applications to improve productivity and reduce costs. SteelHead optimizes the entire hybrid enterprise from on premises to whichever cloud solution or combination of the hybrid cloud that’s right for your business. For every App. Every User and Every Network in your enterprise. Optimization: We deliver up to 100x performance for on-premises, cloud, and SaaS applications with optimization across the hybrid enterprise to users everywhere. Visibility: We identify more applications than any other vendor to streamline management and provide integrated network, application and end user visibility, for optimal application performance. Control: We provide centralized, policy-based controls that are application-centric, so you can easily, direct, prioritize and secure applications across various network paths. By addressing not only bandwidth, but also latency, SteelHead uniquely addresses network performance completely, to deliver the best end-user experience - while minimizing the impact on infrastructure. Deep Packet Inspection (DPI) on SteelHead precisely identifies application flows and classifies over 1,300 applications - on-premises, in the cloud or SaaS. Applications are automatically organized into groups that are logical to the business and to which global policies can easily be applied to meet business requirements and application SLAs. SteelHead delivers optimization for demanding security protocols such as SSL/TLS and HTTPS and secures all traffic flowing between SteelHeads, whether over private (MPLS) or Internet links. Strategic partnerships with Zscaler, and support for external HSMs such as Safenet, offer flexibility for security requirements and simplified integration. SteelHead offers an embedded, single-ended web proxy delivering latency reduction and bandwidth savings for video traffic including VOD, and live streaming such as YouTube. SteelHead can support up to 1 million connections through an intelligent, scale-as-you-grow performance architecture. SteelHead Interceptor amplifies the solution to enterprise scale, with load balancing intelligence and high availability to meet and scale network-wide throughput. 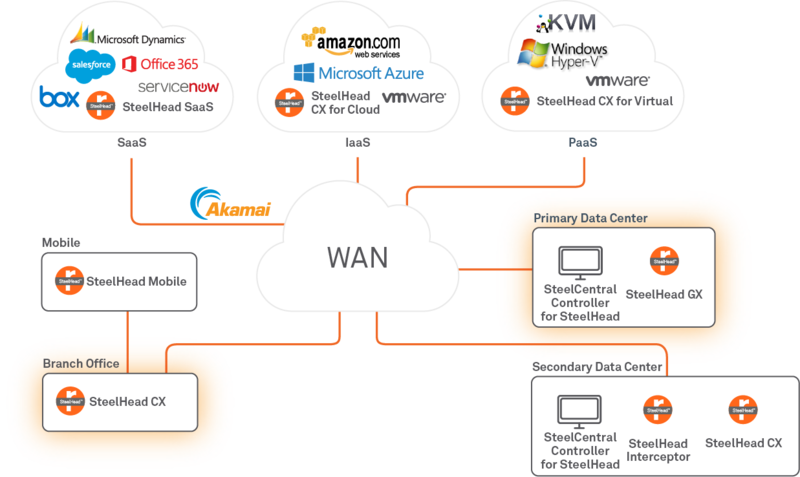 SteelHead for Hybrid WANs is available in a variety of form factors/models, including appliances, virtual software and cloud instances. Northwest Pipe Company has been a leading manufacturer of welded steel pipe since 1966. Key components of its IT environment were reaching end-of-life, at a time when increasing network traffic was saturating bandwidth, leading to “people complaining about apps not running the way they should.” The cost of separate solutions would be expensive. Instead, Northwest Pipe chose Riverbed. SteelHead solves the bandwidth saturation and app performance issues, and provides better visibility into app and network performance. SteelFusion eliminates the need for new servers at manufacturing sites – taking IT infrastructure out of the branch – and also secures manufacturing data by allowing it to be stored and managed centrally in the data center. Easily leverage and control Hybrid WANs to increase available bandwidth, application performance and network reliability at the lowest cost possible. Speed up user access and manage the delivery of SaaS applications including Office 365 and Salesforce.com, and IaaS clouds. Deliver application performance improvements while leveraging the scalability and cost benefits of virtualization. Overcome bandwidth and geographical limitations, improve productivity and enable global collaboration from virtually any location. Transfer and replicate data with greater visibility and control and less cost and risk, ensuring rapid data recovery times and improved business continuity.